Since the opening of Birds Of A Feather in October last year, the cafe/restaurant has been delighting customers with their Sichuan inspired dishes. Coming 6 April 2017, it will be spreading its wings with an expanded menu. One of the new dishes is the Pig Ear Mosaic ($18). 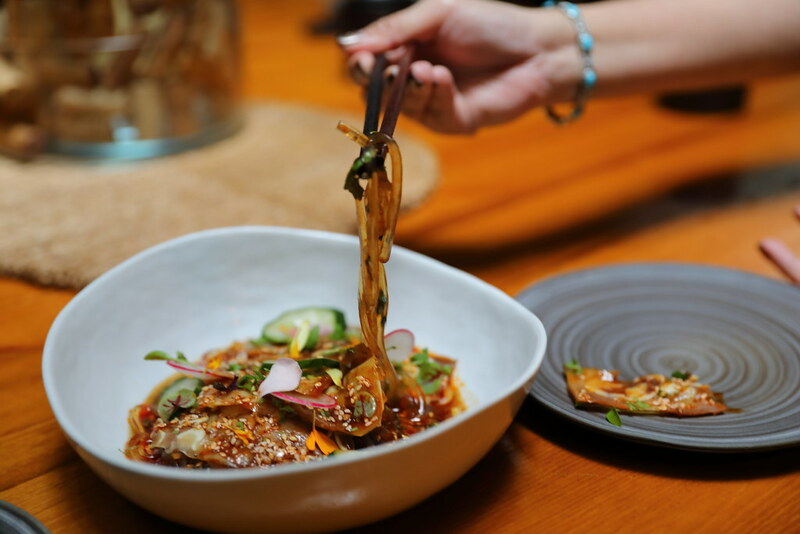 The crunchy pig ear is braised in Sichuan braising liquid and served cold with housemade Sichuan red and sour dressing and arrowroot noodle. Its definitely not for the faint hearted with a low tolerant of spicy food. On the hand, the cold and spicy combination has a refreshing finish on top of the spicy kick. Inspired from the white pork with garlic sauce, the Baby Octopus ($18) is blanched and served in classic Sichuan white garlic sauce. 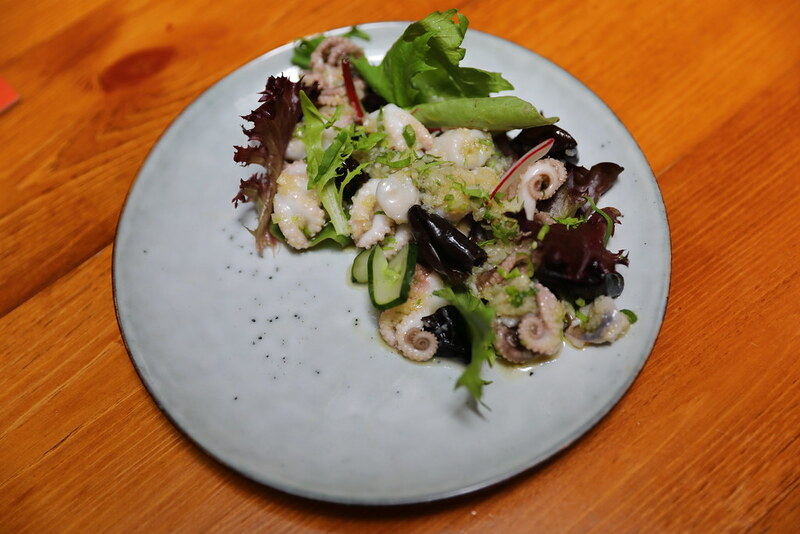 It is paired with refreshing pickled black fungus and Japanese cucumber for an extra crunch. 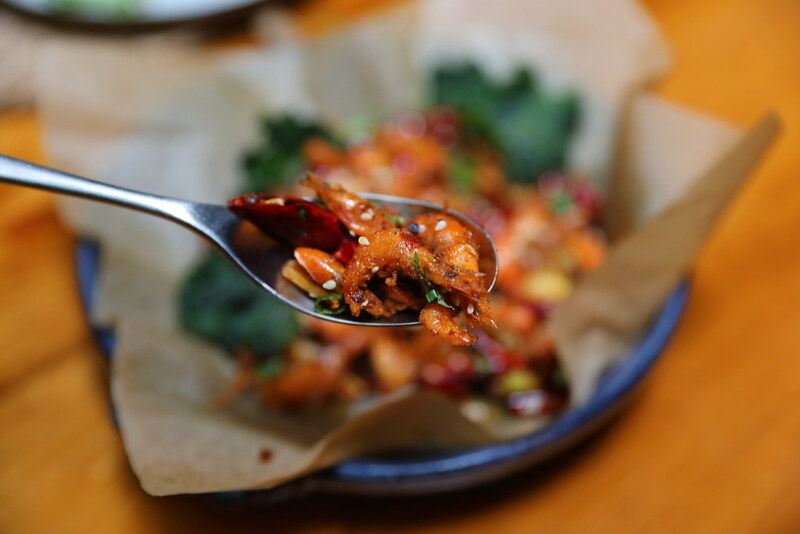 Taking inspiration from their popular La Zhi Ji or Find the Chicken in the Chilli dish, it has created the version 2 substituting the chicken with deep fried river shrimp. The Kawa Ebi Swim in The Chillies ($17) is stir fried with Sichuan pepper, dried chilli, garlic, leek and dou ban jiang. The shrimp seemed to come alive with its crispiness, jumping inside the mouth. I find it very addictive. 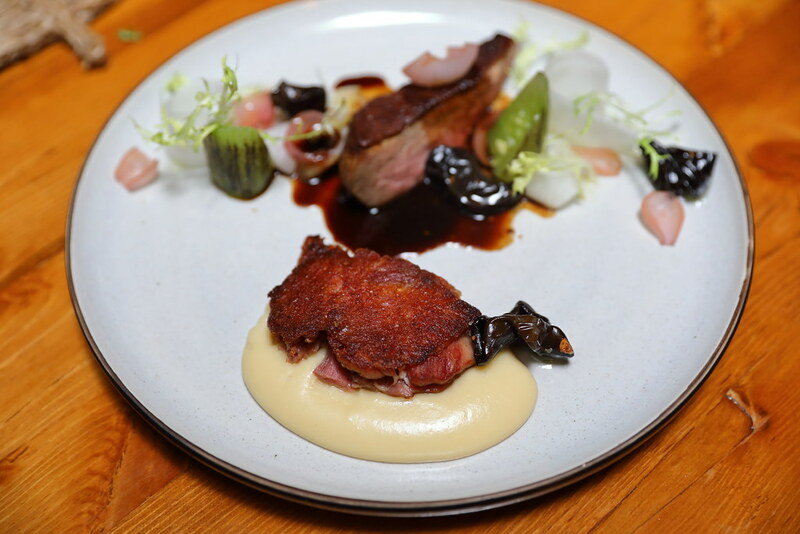 Serving the duck in two ways is the Xiang Su Duck ($30) which comes with seared braised duck breast and duck leg confit. It is paired with roasted potato puree, Sichuan pickled vegetables, Tian Mian duck jus. A cup of white ginger and pear tea is also served with the dish, a nice little touch to wash down the greasiness. This is only for dinner only. Another new dinner item is the Salmon 2 Ways ($23). It made a grand entry with a dry ice cloud. The dish may look simple but it made up of many different components. 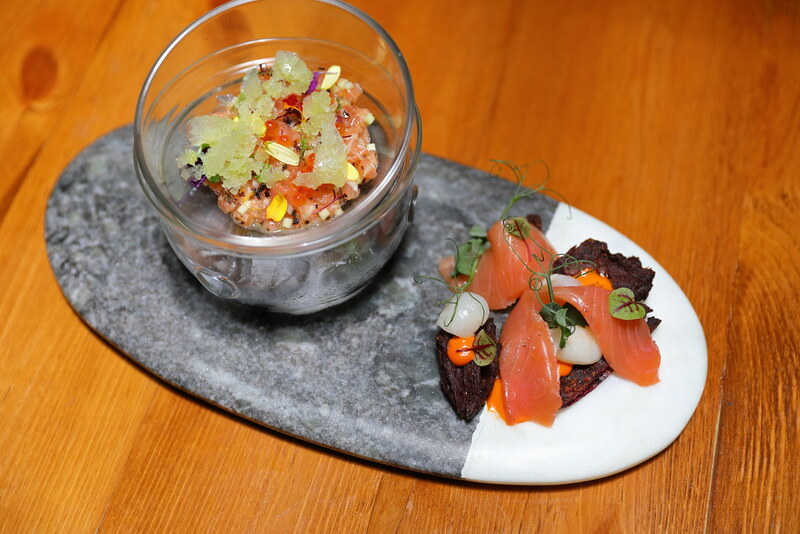 On the left is the salmon tartare served with apple granite with a hint of fresh Sichuan pepper and topped with ikura. I applauded the use of apple granite to give it a refreshing touch. Giving it a contrasting experience of the same ingredient is the cured confit salmon on the right. It is paired with Japanese sweet potatoes, lychee, and roasted bell pepper coulis. I actually did not find the components of the cured confit salmon coming together as a dish but individual they were good. 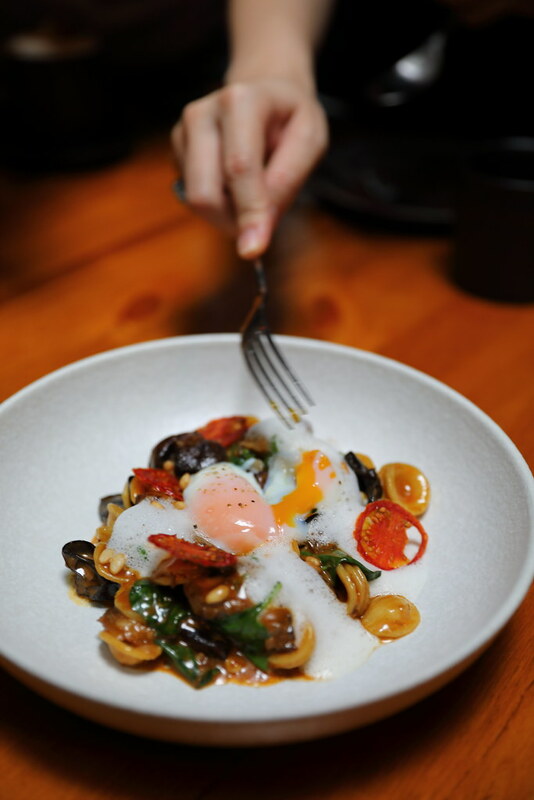 You would get your normal Italian pasta dishes here such as the Hong Shao Beef Ragout Orecchiette ($26) which comprises of Sichuan style braised beef short ribs, Parmesan foam, spinach, black fungus, pine nut and egg confit. The beef ragout is painstakingly cooked via the traditional Chinese way of marinating the beef with dou ban jiang, chilli, salt, and spices for 3-4 hours and then braised for another 3-4 hours resulting in a flavourful end product that can easily paired with any pasta. For the brunch menu, there are also a few new addition. One of them is Big Bird 1st ($25) which is like your big breakfast. 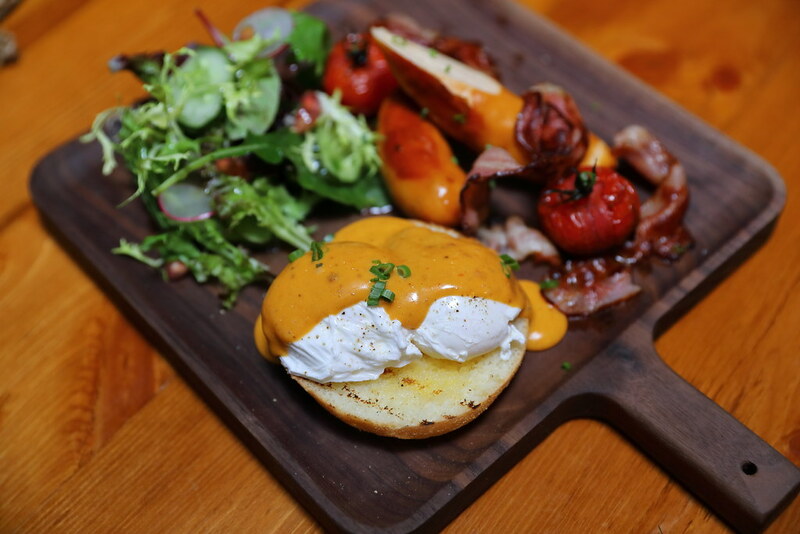 It consists of 2 poached egg resting on Englsh muffin, dressed in Mala hollandaise sauce, bacon, sausage and salad. This is a hearty plate but I would like to have more heat in the hollandaise sauce to get that mala kick. 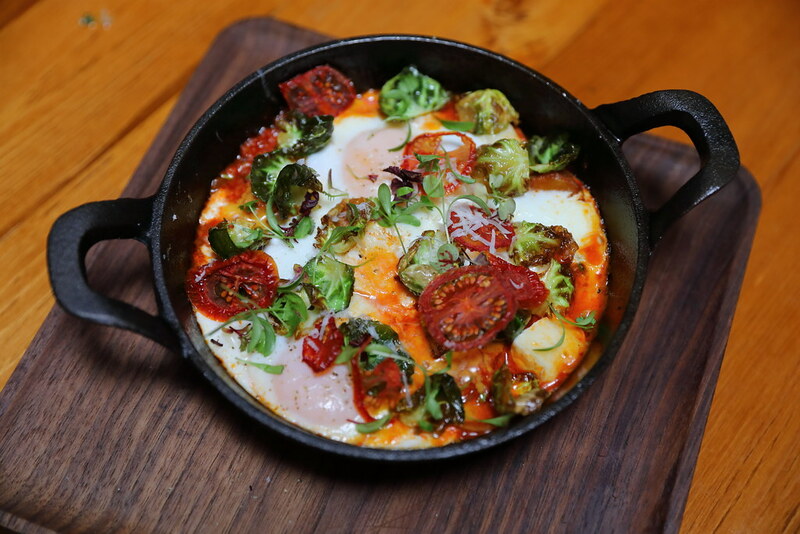 The other brunch item on the menu is the Bird's Skillet ($23) which is vibrantly presented. 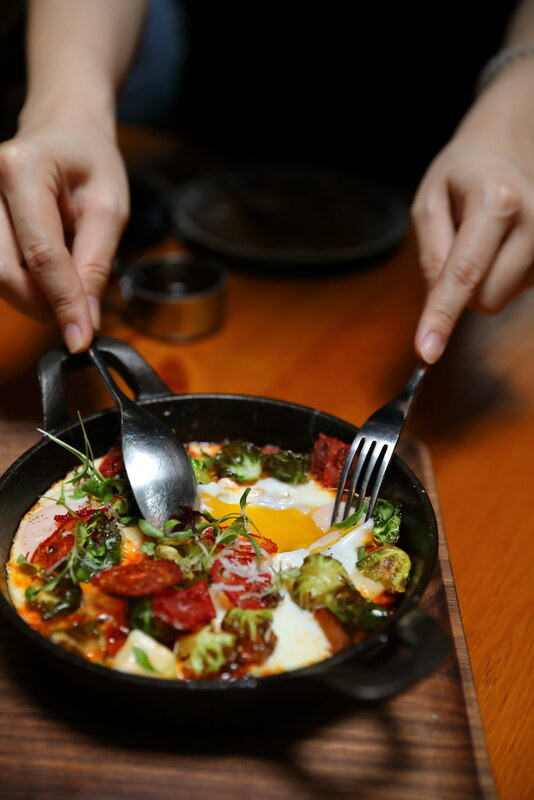 The colorful dish comprises of spicy chorizo, bacon, roasted baby potato, camembert, cheddar, two eggs and pickled red chilli tomato sauce. A dish with multi experience in terms of flavours and textures. Moving on to the desserts, a new creation is the MonoTone ($15). 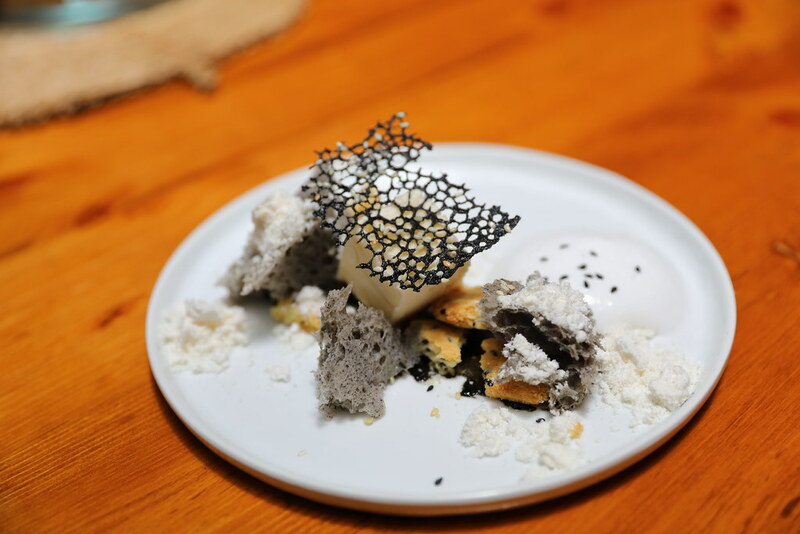 Sesame lovers will adore the dish which represents a sea bed with the black sesame coulis and coral sponge, white sesame parfait and oil powder, sesame sable, light coconut mousse. A satisfying and light dessert to round off the meal. Using their own blend of coffee from China is the GWC (GoodWoodCoffee) Coffee Dessert ($15). 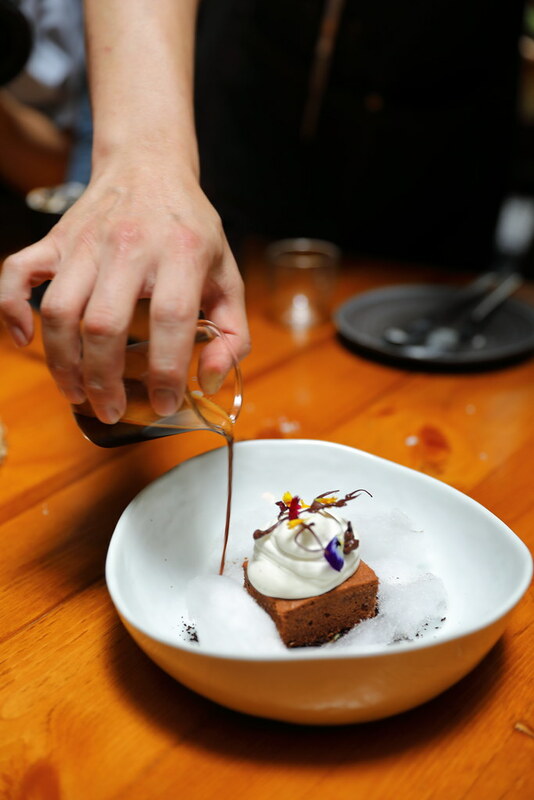 The coffee brownies is topped with Tahitian vanilla Chantilly with a candy cloud surrounding it. On the base is coffee soil. A shot of espresso is poured onto the brownie for a bittersweet appreciation. Definitely one for the caffeine lover. My favourite dessert at Birds Of A Feather has been evolved to a new savoury version. 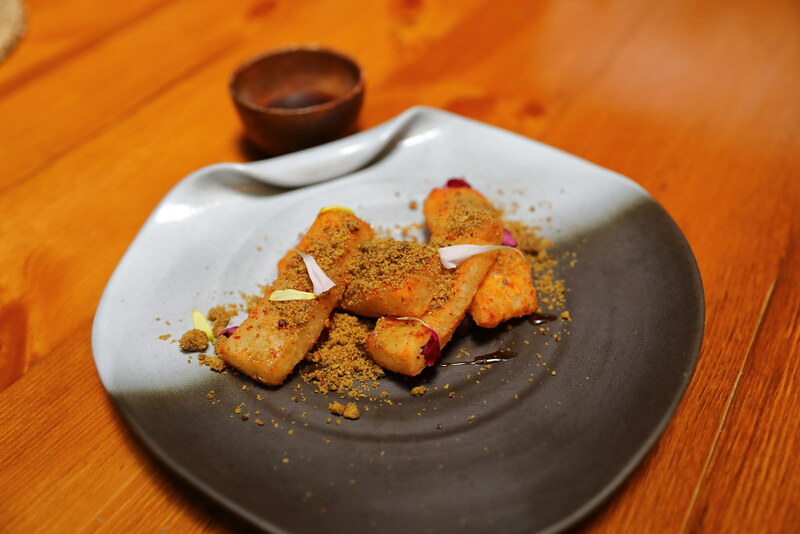 The savory version of the Fried Glutinous Rice Cake ($12) is sprinkled with spicy soy seasoning, pistachio sand, red sugar caramel and pomegranate. The combination definitely has elevated the whole experience. A must try.